The Two Month Extra Strong Extensive Cleansing Program provides gradual permanent cleaning with two daily supplements and instant results with Vale's Solution 4x detoxifying beverage. Designed for heavyweight individuals or those with a history of drug use, the Extra Strong Cleansing Program is also an excellent value with a 30% savings over purchasing each product individually. Vale's Perma Clean is our most popular daily supplement designed to improve detoxification through nutrition that supports liver function. Vale's Flax Boost contains Omega-3 and natural fiber to help improve digestion and accelerate excretion of wastes. Combining both of these over the course of two months will expedite your body's natural detoxification process and get you clean faster. In case you have to submit to a drug screen before you complete the program, two bottles of Vale's Solution 4x our most potent detoxification beverage. Each bottle provides fast, reliable results exactly when you need them. Two packs of Vale's Fiber Boost are also included for use with Vale's Solution 4x. With long-term permanent cleansing and fast acting detoxification on hand, you cannot go wrong with the Two Month Extensive Cleansing Program. Start your personal 2-month program by drinking one bottle of Vale's Solution 4x with one pack of Vale's Fiber Boost. For individuals that will be drug tested during the 2 months detoxification period. 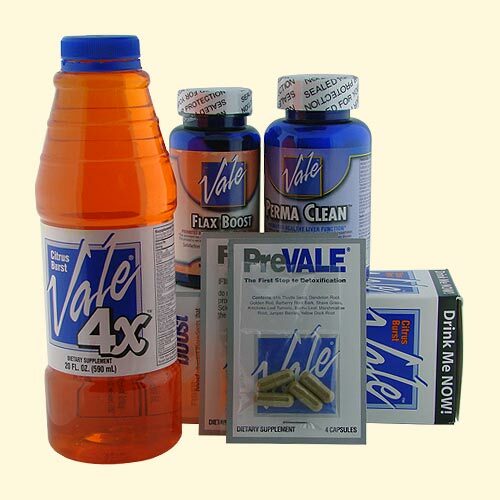 Begin your supplement regimen daily by taking 4 capsules of Vale's Perma Clean with water. Abstain from any unwanted substance while on this program. Your body cannot be cleaned of drugs if they are reintroduced during the cleansing process. Drink plenty of water on a daily basis, a well-hydrated body can remove metabolic wastes and drug-related toxins more effectively and quickly.